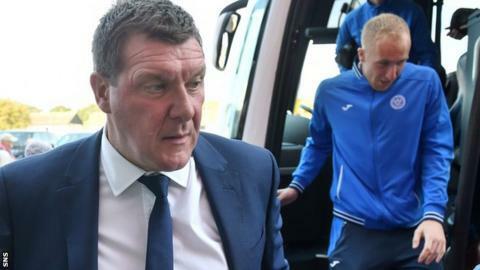 Tommy Wright has extended his contract with St Johnstone - a week after Dundee United had an approach rejected for their 52-year-old manager. The Northern Irishman is now contracted to United's Scottish Premiership rivals until June 2019. Wright told his club website: "I am enjoying my time at the club, and I do feel there's still a lot to be done and a lot to be achieved. "I would like to thank the chairman and the club for their continued support." St Johnstone say Wright, who replaced Steve Lomas - to whom he had been assistant - in June 2013 "has been in charge at McDiarmid Park during the most successful period in the club's history". The Perth side have had back-to-back top-six finishes in the Scottish top-flight and won the Scottish Cup in 2014 - their first major trophy. "When I look at the squad of players, I realise how well we've done to assemble such a strong team and I know we can achieve more success together," Wright added. United had been seeking a replacement for Jackie McNamara, who was sacked in September. However, they dropped their interest in Wright after St Johnstone rejected their request to talk to their manager. The Tannadice club subsequently made an approach for John Hughes of Inverness Caledonian Thistle, who also rejected United's approach.